Never in the history of Thai tourism has any source-market grown so strongly, both in terms of percentages and actual numbers. 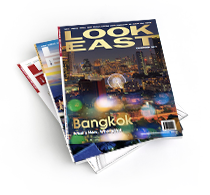 China has surged to the top of Thailand’s visitor source-markets, leap-frogging the long-standing front-runner, Malaysia. Chinese arrivals totaled 2,789,345 in 2012, up by a huge 62% over 2011, and comprising a market share of 12.51% of total visitor arrivals to Thailand. The figure has more than trebled in four years and there is no end in sight to the future growth potential. In 2006 and 2007, Chinese visitor arrivals nearly crossed the one million mark but fell in 2008 due to various factors, including political instability in Thailand and global economic conditions. Arrivals fell by 8.87% to 826,660 in 2008 and again by 5.95% to 777,508 in 2009. However, those few years have been followed by a remarkable turnaround, with growth figures of 44% in 2010, 53% in 2011 and 62% in 2011. Thailand is a short-haul and value-for-money destination with good airline connections and visa on arrival facilities for Chinese visitors. The kingdom is also well known for its long-standing tradition of friendliness and hospitality. Thailand and China have much in common in terms of food, cultural and ethnic relationships. Many Thai prominent businessmen and political families have roots in China. Bangkok has a very large and bustling Chinatown area where Chinese visitors can regularly be seen shopping for herbal medicines, jewelry and gold. Many of them also go to make offerings at the numerous Chinese temples. As the Chinese middle class grows and they become more familiar with global travel, the customer segment profile and demographics of Chinese visitors are also changing. 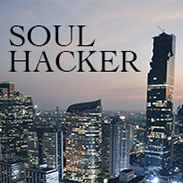 But regardless of whether they are coming for business, MICE, holiday, honeymoon, sports, etc., both high-spenders and economy visitors find an extensive range of places to stay, eat and shop as well as many activities to enjoy in Thailand in accordance with tastes, preferences, and budget. Top five destinations for Chinese visitors to Thailand are Bangkok, Pattaya, Phuket, Rayong, and Chiang Mai. 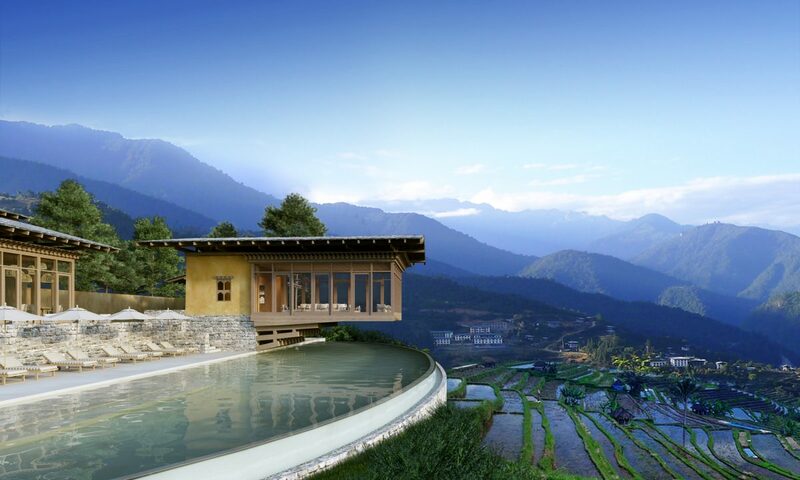 Increasingly, however, Chinese visitors are also venturing beyond to more exotic, upmarket destinations. The Tourism Authority of Thailand has four offices in China (Beijing, Shanghai, Kunming and Chengdu) and plans to open one more in Guangzhou. In 2007, Thailand was voted one of the world’s most favorite destinations for Chinese tourists. In early 2013, the release of the slapstick comedy Chinese movie “Lost in Thailand” proved to be a hugely popular hit, triggering another surge in visitors, especially during the February Chinese New Year festival. Along with the number of arrivals, the average length of stay as well as the per capita expenditure has been growing. Chinese tourists have high discretionary spending power and find Thailand good value for money, especially for their two favorite pastimes, eating and shopping. 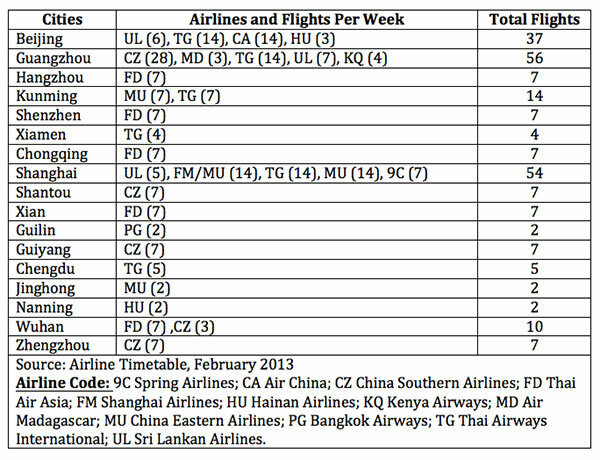 In 2012, Chinese visitors stayed an average of eight days and spent an average of Bt4,716.56 (US$151) per person per day. This generated Bt45.55 billion (US$1.4 billion) tourism foreign exchange revenue for the Thai economy, making Chinese visitors the largest generators of tourism revenue for Thailand. 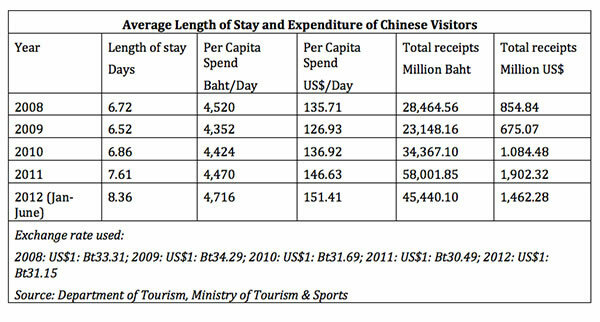 The demographic profile of Chinese visitors for 2012 was being tabulated by the Ministry of Tourism and Sports at the time of writing, but figures for 2011 offer a very good indication. These figures are calculated on the basis of arrivals by country of residence, which totaled 1,704,800 in 2011, just slightly less the total of 1,721,247 in arrivals when tabulated by country of nationality. Overall, however, the difference is marginal and has no meaningful statistical impact. The ratio of male:female visitors is fairly even matched, which is a good sign and in line with the Tourism Authority of Thailand marketing targets. Female visitors surged 54.52% to 797,812. First-time visitors were up by 50.80% to 996,015. 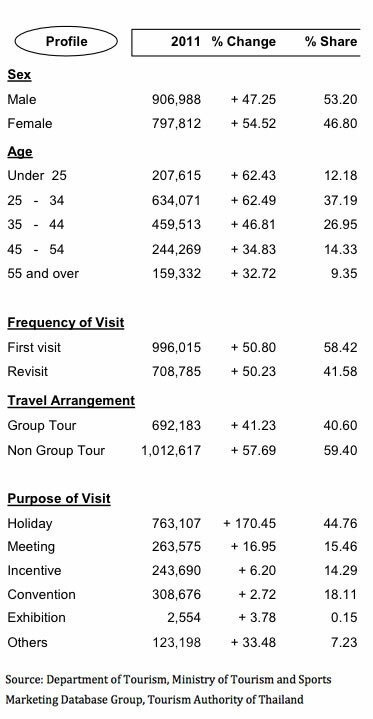 Independent Travelers (meaning those not traveling in groups) were up by 57.69% to 1,012,617. Meeting delegates were up by 16.95% to 263,575 and convention delegates were up 2.72% to 308,676. Senior citizens were up by 32.72% to 159,332. China is expected to remain Thailand’s top source of visitor arrivals for the foreseeable future. Another major contributing factor will be the growing Asian Highway road links that will connect North Thailand to Southern China, via Laos. While these growing numbers will be good for business, job creation and economic prosperity, they will further heighten the environmental, social and cultural pressures that the Thai tourism industry faces over the rest of this decade and beyond.